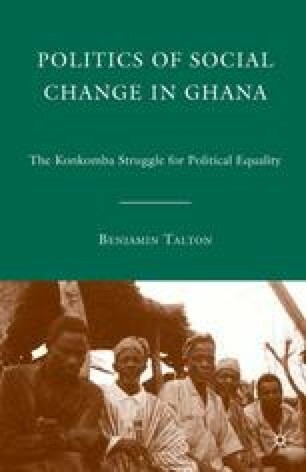 Between 1955 and 1994 Konkomba leaders in Tamale, Saboba, and Accra promoted the idea of a Konkomba community of belonging that would allow them to assert Konkomba as one of Ghana’s politically legitimate tribes. Political legitimacy meant economic and political autonomy and direct representation by a recognized paramount chief at the Regional and National Houses of Chiefs—the quasi-government bodies with authority over the nation’s “customary” affairs. Issues of chieftaincy and tribe are broadly conceived as products of Africa’s precolonial past. However, Africa’s twentieth-century history shows that both are very much part of the fabric of modern African politics. Few Konkomba identified themselves with a broad Konkomba community of belonging prior to Ghana’s independence in 1957. Yet by 1994 Konkomba were embroiled in a multi-clan conflict that grew out of their leaders’ efforts to assert Konkomba as social and political equals to their historically dominant neighbors.